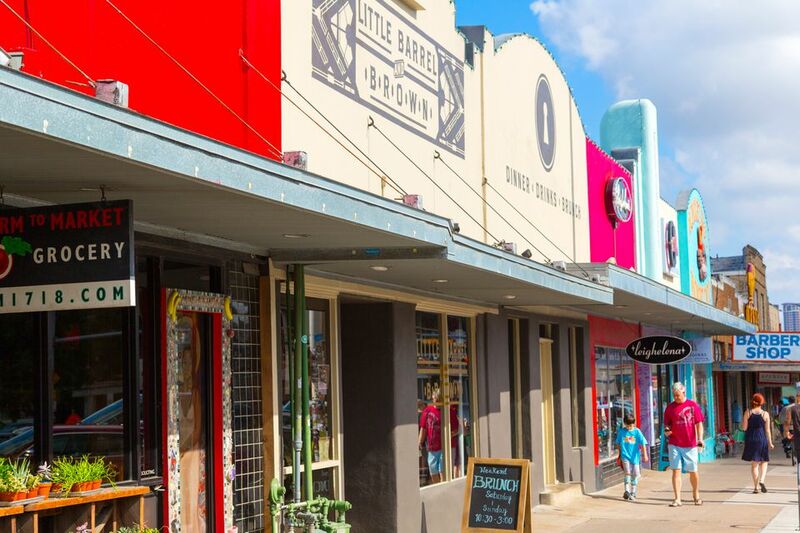 The segment of South Congress Avenue between Riverside Drive and Oltorf Street in Austin has evolved into a pedestrian-friendly entertainment district full of restaurants, bars, and antique shops. Here are some of the best eateries on the strip. The sprawling tree-shaded patio in front of the restaurant makes Perla’s a popular choice during nice weather. Oysters are the main attraction here. Perla’s flies in oysters from British Columbia, Prince Edward Island, and Maine. You can enjoy them raw or cooked, with creole tomato butter or fried in cornmeal. Beyond oysters, the pan-roasted Hawaiian escolar served with bacon and goat cheese is another excellent choice. For a salty-sweet, crunchy-creamy finale, go for the salted butterscotch pot de crème. Hopdoddy has become so popular that there is often a line out the door even in the middle of the sweltering Austin summer. But people are willing to wait for Hopdoddy’s jumbo-sized burgers with ingredients ranging from poblano peppers to various types of mushrooms. The parmesan truffle fries are also addictive. Located in a warehouse-like space that was once a feed store, Guero’s is often the busiest restaurant on South Congress. It’s mostly standard Tex-Mex fare, but they do a few things very well. The salsas and guacamole are always fresh, and the margaritas are always strong. Don’t miss the tangy tacos al pastor. You can order a full-sized plate, or order as many as you want of the appetizer-sized tacos a la carte. It’s a popular after-the-lake meeting place on Sunday afternoons. The shaded outdoor patio features free live music, presenting everything from conjunto music to jazz. The food is consistently amazing, but don’t come here if you’re interested in having an intimate conversation with your dining companion. The exposed-brick walls form an echo chamber, making it difficult to understand the person sitting across the table from you. At brunch, try the eggs Benedict with steak and migas or the eggs Benedict with crabcakes. Another standout dish, the short ribs are served with spicy pickles, potato salad, and tobacco onions. Upscale but not stuffy, Vespaio is one of the best Italian restaurants in Austin—if not the best. The kitchen does as much as possible on site, including making gooey, delicious mozzarella and one-of-a-kind desserts such as blackberry olive oil cake. All of the seafood dishes routinely earn high praise—particularly the mussels with capers. Another Italian food mainstay on South Congress, Botticelli’s is a little more affordable than Vespaio and perhaps even more charming. Start with Botticelli Bread, which is stuffed with prosciutto, mozzarella, and roasted bell peppers. The small beer garden out back is a nice place to dig into a hearty plate of lasagna, sip red wine and listen to a low-key band. If you’re feeling more adventurous, try the ravioli stuffed with butternut squash. For dessert, the chocolate ganache is always a solid choice.